Choosing a dairy-free diet could significantly improve your health. Numerous studies studies have proven it. In America, we have been consistently programmed through the media over the past 60 plus years to believe that milk and dairy products are necessary in our diet. The fact is that consuming dairy products can have a negative impact on your health, whether you know it or not. The following are just five of the many reasons why you might want to choose a dairy-free diet or at least reduce your intake of dairy foods, such as milk, cheese, butter, ice cream, sour cream, cottage cheese and yogurt. Lactose intolerance. According to Dr. Mark Hyman, about 75% of the world’s population is genetically unable to properly digest milk and other dairy products, a health issue called lactose intolerance. Noticeable symptoms include gastrointestinal problems, gas, bloating, diarrhea, constipation, allergies, asthma and other respiratory issues. However, the vast majority of people who are lactose intolerant are undiagnosed. Some ethnicities have higher lactose intolerance than others. For example, it affects 95% of Asian Americans, 74% of Native Americans, 70% of African Americans, 53% of Mexican Americans, and 15% of Caucasians. With or without symptoms of lactose intolerance, anyone who consumes dairy products is at higher risk for developing chronic illnesses. Increased risk of heart disease and diabetes. Dairy products are high in cholesterol and hydrogenated fat, which are known to increase the risk of heart disease. And contrary to popular belief, non-fat and low-fat dairy products are not much better. One of the reasons for this is because non-fat dried milk is added to non-fat and low-fat milk. According to Dr. Mercola, “The cholesterol in non-fat dried milk is oxidized and it is this rancid cholesterol that promotes heart disease.” In addition, non-fat dried milk has a high nitrite content. The consumption of dairy products is also linked to diabetes, especially child-onset diabetes, Type 1, as explained in the same article from NutritionMD.org. Higher risk for cancer. Several cancers—most notably, ovarian, breast, prostate and colon—have been associated with consumption of dairy products. Numerous enzymes are required to break down the milk sugar lactose into galactose. According to a Harvard study by Daniel Cramer, M.D. and others, when dairy consumption exceeds the levels of enzymes needed to break down galactose, it builds up in the blood and can affect the ovaries. Increased risk of breast and prostate cancer is linked to a compound found in dairy products called insulin-like growth factor (IGF-1). Dr. Shinya, who is also world renown in the field of colonoscopic surgery, writes that patients who consumed a diet high in animal protein, including dairy products, also had a higher incidence of cancer. Since dairy products also do not contain dietary fiber, they contribute to an unhealthy intestinal environment, often leading to diverticuli and polyps. Chronic dehydration exacerbates the problem when dairy foods are consumed. Dr. Shinya recommends a dairy-free diet to his patients. Hormones and chemicals. Synthetic hormones are given to dairy cows to increase production of milk. Recombinant bovine growth hormone (rBGH) is commonly used. The overproduction of milk often causes infection in the mammary glands of the cows, which then requires the use of antibiotics. 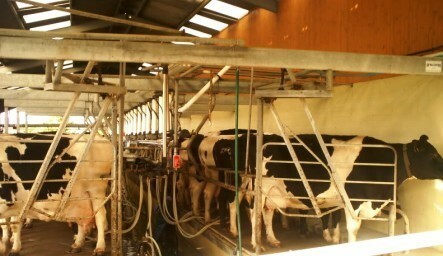 In addition, dairy farms often use pesticides and other chemicals to keep all the equipment sterile. The end result is that traces of hormones, antibiotics and other drugs, as well as chemicals end up in the milk and dairy products. Please note that the references listed below are for articles that contain more information about these five reasons, along with references to clinical studies. When it comes to nutrition, the issue is not so much about the amount of a specific nutrient (such as calcium) that one gets, but rather the form that the nutrient is in, how well the body can digest and utilize it, and the synergistic effect of other nutrients in food that help to optimize nutrient utilization in the body. For example, we now know that vitamin D and vitamin K are essential for helping to get calcium where it is most needed in the body—mainly bones and teeth. Eating a dairy-free diet that includes an abundance of green vegetables can improve bone density. The best way to protect your bones is to reduce the amount of animal protein and dairy foods in your diet and to eat more fresh, unrefined plant-based foods. You will get more than enough absorbable calcium from a healthful diet of fruits, vegetables (especially leafy greens), grains, seeds, beans and whole grains. If you or your child is unable or unwilling to eat green vegetables, you might want to supplement with a food-based calcium. A few brands I recommend are AlgaeCal Plus and Garden of Life Raw Calcium. You will get maximum bone health benefits if you also get exercise daily, preferably weight-bearing exercise, such as walking, running, or lifting weights. The bottom line is that we do not need to consume dairy products for optimal health. In fact, for the vast majority of people, consuming them will most likely deteriorate their health over time. “Nutrients found in milk are suitable for growing calves. What is necessary for the growth of a calf is not necessarily useful for humans. Moreover, in the natural world, the only animals that drink milk are newborns. No animal drinks milk after becoming an adult (except Homo sapiens). That is how nature works. Only humans deliberately take another species’ milk, oxidize it and drink it. It goes against natural law. ﻿If you value your health and are ready for a change, I challenge you to a completely dairy-free diet for at least one month (three months would be even better). First, as always be sure you are drinking enough water daily to stay fully hydrated. Second, focus on eating an abundance of fresh, plant-based foods--primarily vegetables, along with 2 to 3 daily servings of fruit, whole unrefined grains, healthy fats (avocadoes, nuts and nut butters, seeds, olives, olive oil, coconut oil)—as well as either plant-based protein or small amounts of lean animal-based protein, preferably fish and poultry. If you consume animal protein, quality is the key. Whenever possible, buy wild fish rather than farm raised fish. Also choose grass-fed, hormone-free beef, turkey or chicken rather than commercial products made from animals raised on hormones, antibiotics and drugs, and who have a poor diet and restricted movement. Try out some of the dairy alternatives as needed: such as rice milk, coconut milk or almond milk in place of cow's milk. I don't recommend soy milk since many people have a hard time digesting soy and it can create hormonal imbalances. In addition, most of the soy in America is genetically modified. If you can’t do without cheese, try the non-dairy cheeses found in many health food stores. You can also find coconut and almond milk ice cream, which are very satisfying for an occasional treat. After 30 days, take an honest look at how you look and feel, your energy levels, your digestive health, your skin and hair, as well as any changes in allergies, asthma, or any other condition you may have had. We trust that most people will notice a positive difference. If you simply love the taste of milk, cheese or dairy products and can’t live without them at this time, I strongly encourage you to reduce your consumption and only drink milk that has not been homogenized or pasteurized at a high temperature. Hiromi Shinya, M.D. ; The Enzyme Factor; 2007.